Baguazhang is an internal martial art and exercise form which can only be reliably traced as far back as the late 19th century. The name means "Eight Diagrams (or Trigrams) Palm." It is sometimes written instead as Pa Kua Chang - Pa Kua Chuan -Baguaquan, or simply abbreviated to Bagua. Baguazhang is soundly linked to Taijiquan (Tai Chi Chuan), and Xingyiquan (Hsing I) which are sometimes referred to as the "Three Sister Arts". These internal martial arts rely heavily on the classical and cosmological views developed in Taoist alchemy and medicine for their foundations. To understand the complexity of internal Chinese martial arts a brief excursion into Taoist thinking is worthwhile for any serious enquiry. Baguazhang (Pa Kua Chang - Pa-kua ch'uan) is purportedly derived from the metaphysical diagrams generated from the I-Ching -The Book of Changes. Oldest parts date from 800BC more recent 200AD.The I-Ching was originally a collection of linear signs, perhaps best seen as code. (not unlike binary code) Below are typical examples arranged in hexa-gram sets. The broken lines yin lines represented 'no' -the unbroken yang lines 'yes' conveniently serves as code complex enough to be used as oracle 'cards' which portrayed a vision of the Taoist Way -where one is aware and becomes in harmony with the process of change. The key code of yang lines balanced with yin lines were arranged in Tri-grams. These tri-grams were arranged into the Pa Kua or eight correspondences which sought to describe the basis of change developing from one thing to two to three to all things. The Tao. The Taoist vision thus at least schematically demonstrated multiplicity of yin-yang possibilities and interrelations through the Pa-kua and other diagrams. Such diagrams served to classically illustrate a interwoven selection of key ideas germane to Taoist visions of change and internal martial arts. Two of the most well known diagrams describe the Tai Chi Principle of Taijiquan and the Eight Correspondences are frequently used as a root expression of the three sister arts. The history of Baguazhang as an internal form of martial arts is unclear. The most acceptable theory suggests that Dong (Tung) Hai-ch'uan (1798-1879) learned Bagua from a Daoist named Dong Menglin of Jinhua Mountain in Anhui Province. After rising in fame in Bejing (Peking) Dong (Tung) was challenged by Kuo Yen-Shen of Hsing-i chuan both were equally matched and stalemate resulted. A pact between these two masters ensured that their future students were to be instructed in both internal styles. Notable students include Yin Fu, Cheng Ting-hua, Ma Wei-chi, Liu Feng -chuan and Shih Liu. Expert Baguazhang (pa-kua ch'uan) practitioners will move behind an opponent and upset the balance and harmony of the antagonists. Therefore, to deal with an aggressive opponent, one should first cross either the body and or arms, preferably both and then employ ground strength techniques where appropriate. 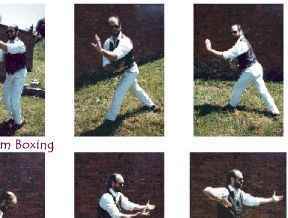 Advanced Baguazhang students are taught to move not head to head but obliquely by "turning his corner" and then generating an opponents weakness as an attacking ploy. 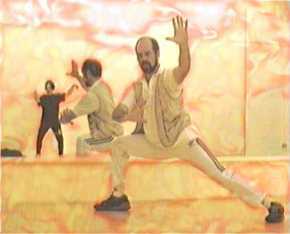 Some exposition of palm or body pushing is shared with Taijiquan. Both hands can work together to push-pull-press slightly to disrupt the opponent's root and propelling them in a leading direction. The waist represents a major axis of the body which leads every action. 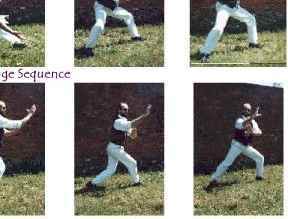 Baguazhang employs infrequent leg manoeuvres, and are only considered effective when kept low, performed as a counter, or are executed only when the opponent's posture is broken. Instability in kicking is mitigated partly if the kicks are kept low and executed only against an unbalanced opponent. Baguazhang for health instructs us in the value of softness in relaxation, slowness in the prolongation of postures, and an evenness of actions and breathing. Further that we should move the body naturally, stretch the arms but withdraw the trapezius muscles, harmonise the vital energy (ch'i) and strength (chin), and keep vital energy concentrated before the navel in the tan-t'ien. Core postures express more directly the natural actions of the body than one might at first suspect. Postural integrity is a wise prerequisite to develop in all exercise forms. The integration of mind with body purpose allied with ones spirit enhances daily life at its most mundane levels. The chief exercise of Baguazhang (pa-kua ch'uan) is "walking the circle". Through this repetition the body learns to revolve and to rotate the torso in a particular style. The ability to walk with swiftness and ease is linked to a few basic actions. The walking represents the passage of time linked to change. Fluidity and constancy of action encourages balance and unruffled intent.Ones intent should be concealed in combative forms. The most basic change is the single palm change (tan huan chang) from which the double palm change (shuang huan chang) and all evolving changes can be considered to be formed; in keeping with Taoist principles. Like other internal (nejia) martial arts Yin-Yang movements are in constant change and naturally direct every action. Keyed on these various formal sets of circling postures, are the combative antics classically related to the movements of the snake, lion, dragon, monkey, hawk and the bear. 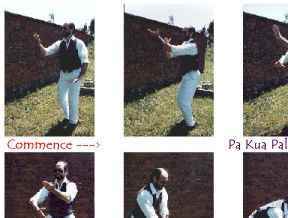 Principles of Baguazhang (pa-kua ch'uan) use the palm in eight directions.The palm can then face upwards (yang palm), downwards, outwards, embracing, splitting/cutting, inwards as if pushing up and out, forwards -up. and the eighth palm is moved to spiral upward and then outward. 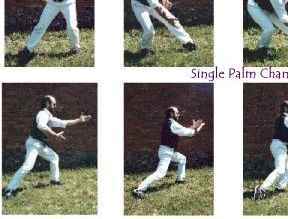 The palm with its power and flexibility over the fist is the major weapon employed in baguazhang. The tiger's - mouth (hu k'ou) is the area of the hand from the thumb tip to the tip of the index fingers, and is used sparingly. The opponent must be stretched or unbalanced if an attack is to result in the desired results. 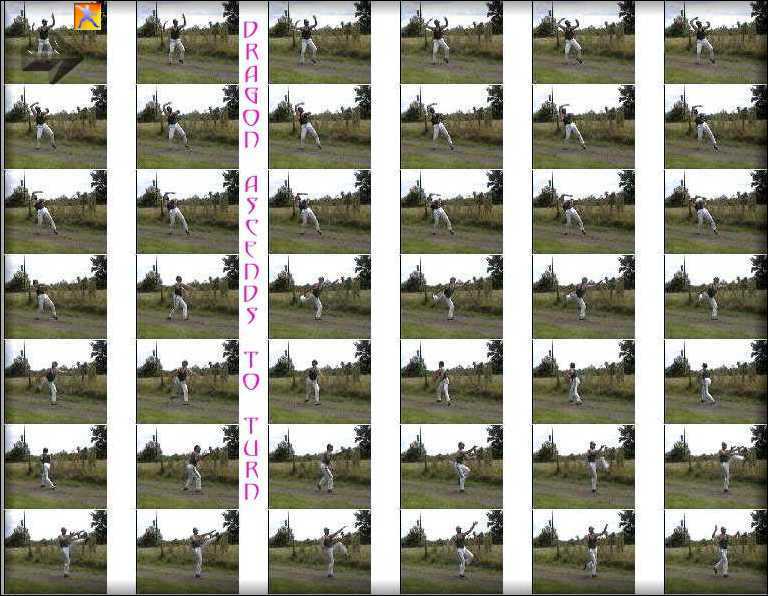 The arms move as part of the body; and every action is circular, which imparts speed and power. In short, the essence of Baquazhang is circling movements manifested by the arms, waist body, head and palms in their changes. Useful references for further study. Pa-Kua Chang for self defence. Lee Ying-arng & Te-hwa. The Way of the Warrior (IBSN 0 7126 00809). Howard Reid & Michael Croucher.